This photograph by BME member Diada, was the second one voted as photo of the month for February. We asked Diada to share her thoughts on this image. Her responce? Cats have no doubts! This is the first of the two photo of the month for January (we had a tie again between Justin Vogel and Diada) as voted by “Burn My Eye” members. As always we ask the photographer, in this case Justin, to treat us with the backstory of his photograph or a personal insight. I took this photo at the one year anniversary of the Women's March in NYC. The previous year I had gone down to DC to protest Trump's inauguration but after a year of his hatred and narcissism I just didn't have it in me to make the trek again. I think I made the right choice because this rally was uplifting, energizing, and inspiring. I believe this photo captures the general consensus of the crowd: Fed up, and disgusted, but with a sense of humor. This is our photo of the month for January as voted by “Burn My Eye” members. As always we ask the photographer, in this case Lukas Vasilikos, to reveal the backstory of their photograph or a personal insight. This is the second photograph that was voted as photo of the month for December by Burn My Eye members and is by Don Hudson. If you follow this thread you will probably remember that there was a tie between Don and Gustavo Minas whose image was featured last week. It’s an old photograph but Don unearthed it from his archives only recently. “In the Summer of 1978 my wife and I moved to the small town of South Lyon, about 15 miles from Ann Arbor Michigan where we both worked. That Fall I noticed a lot of banners, window paintings, and other decorations supporting the local High School football team going up around town. Curious about the fervor suggested by the decorations, I went to the Friday night game. Liking what I experienced, I wound up shooting at my hometown games and at other games in towns around me for four seasons. My rig, a rangefinder camera with a wide angle and strobe, was not the typical sports photographer's set-up. And I wasn't interested in "documenting " the events as much as I was curious about photographing in such an atmosphere of heightened social energy and under weird (for me) lighting conditions. I became addicted to the quest to find pictures that transformed this experience. Recently, I have been revisiting these pictures made nearly 40 years ago, and this is one example made in 1980”. In this month's vote for the best photograph we had a tie between Gustavo Minas and Don Hudson. Next week we will post the second winner. I work as a journalist and social media editor in Brasilia from 2pm to 10pm. This shifts make it possible for me to go out everyday to shoot when light is better, any time from 4PM to 7PM, depending on the season of the year. It feels great to leave my job to do something I love, even if for a short break. This image was made in one of those free hours. For me, it's a lot about its negative space (that huge block of red), something that Saul Leiter mastered and I think it's very hard to do well. It's also about how a tiny detail (that cigarrette in hand), that's roughly 1% of the frame, can be so important for an image. And it's also about how beautiful a woman in red smoking a cigarrette can look, even when we can't see much of her. There is nothing I enjoy more when I’m out shooting than small crowds of people where I can merge with them and pass virtually unnoticed even when I’m photographing very close and occasionally using handheld flash. I don’t use extreme wide lenses, and I don’t want to ridicule anyone by capturing them in an awkward moment. If that accidentally happens, I don’t show the picture. In such a busy environment, I find it very challenging to pack as many elements as possible into a tight frame without the image falling apart, even as the subject is constantly shifting. This photo was taken at a street party in Athens. Besides being an exercise in the above, it is also part of an ongoing series of mine called “Fair enough!” The man in the center, who has his arms above his head, is the anchor of the image and what triggered the shot. This is what I saw. The two men on the left are almost touching heads, and it appears as if one is whispering something to the other who in turn looks dumbstruck. This is what the camera saw. I was recently on a flight back to Taiwan after teaching a BME workshop in Bangkok with fellow members Barry Talis and Rammy Narula. As the plane circled the airport before landing, rays of the afternoon sun floated across the cabin, briefly illuminating the face and red scarf of the stewardess sitting under the flight path map in front of the exit row where I was seated. I had my camera with me and was able to catch the moment the light flitted across her the second time the plane turned before landing. The sound of the shutter made her look up, but my camera was already tucked away. Saline, Michigan 1978 - In 1978 my wife and I bought our first house in the small town of South Lyon, Michigan, about 15 miles north of Ann Arbor where we worked, and thus began my photographic exploration of the culture and events in my new town, and other small towns around Ann Arbor. Both South Lyon and Saline, a town south of Ann Arbor, were considered "horse towns", with many farms dedicated to breeding and training horses for the racing venues in southeastern Michigan and equestrian teams at the schools. 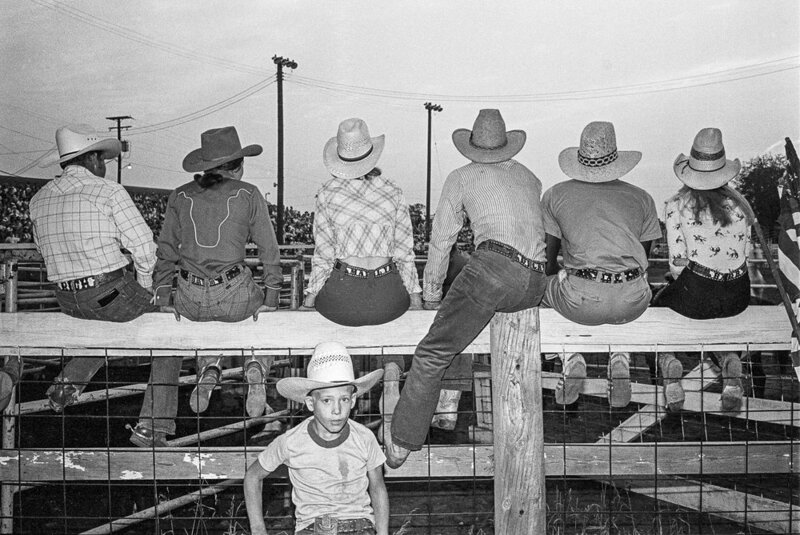 For two years 1978-79 I photographed at the rodeos and horse shows in the two towns. I've posted some of those photos on social media over the last few years, but this is one not seen by anyone until just this past month. Our Photo of the Month as voted by Burn My Eye members is by Gustavo Minas. Here's what Gustavo Has to say about this image. "This photo was taken in Centro Havana last January. Even after night falls, Cubans spend a lot of time in public spaces, so one can photograph all day. Streets feel very safe too. I was focusing on the 2 kids in the background when the blurred boy showed up and made the photo for me. Although I'm always trying to have control over the images and scenes, the unexpected is still what I love most about photography. "